Do you have any junk drawers? If so, do you ever look in them? Or, are you like me and consider those items simply lost in the abyss of things you may need right this second, yet can never locate? I have one of those in my kitchen, right next to the silverware drawer. Most days it is overflowing with anything I don’t want laying on the counter, which equals a total mess. Need an ink pen? Digging through there may or may not lead to one. This past weekend I made a whole new discovery thanks to my beautiful, amazing mom who washed all of our laundry on a recent visit. Because she essentially did all my chores, I found myself with a little free time on my hands. Sort of milling around trying to find something I should be doing, I found several more drawers packed to the brim. Although they weren’t in the kitchen, clearly they were catch-alls. Just stuff. Lots of stuff. I suppose I could empty those drawers and put those items elsewhere. That would make sense, pictures with pictures, mail with mail, etc. However, I’m kind of in love with the idea of having all those life stories intertwined. I had some of those things before Little Bit was born, yet they are all content mingled together. It’s almost like the greatest story prompt in one place. 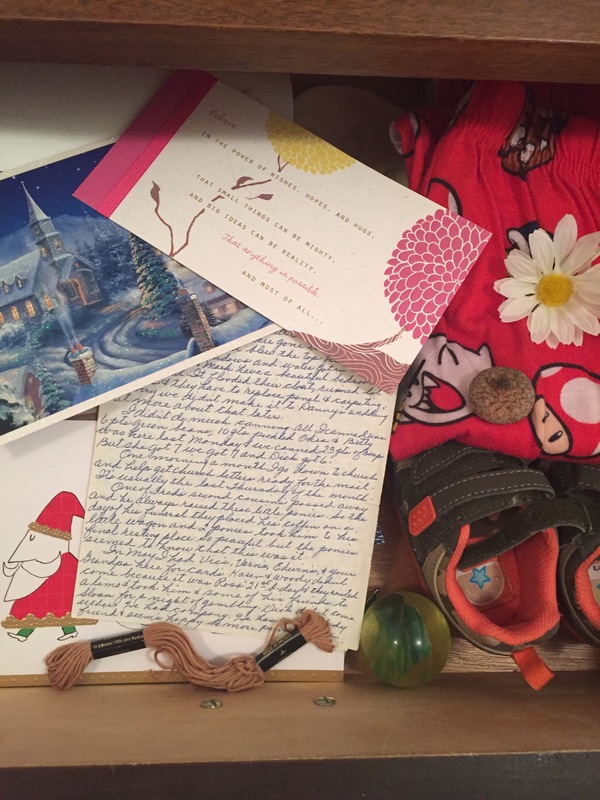 Being able to chronicle our lives by opening a drawer? Seems quite brilliant, really. Well, here is something I never thought I’d say, I can’t wait until my chores are done so I can dig around in the “junk” drawers again! That’s pretty cool. Who knew that an ordinary junk holder could be such a gift?